If there’s one thing history has taught us: technology fails if using it makes you look like a plonker. I don’t mean a bit silly, like skiing on a Nintendo Wii, or a little crackers, like running around in Snapchat’s Spectacles. I mean the sort of technology that when you look across a room and see someone wearing it you don’t think “wow” or “that’s futuristic”. That’s how I felt when Rory started wearing Google Glass (sorry, Rory) and that’s how I've always felt about 3DTV. That was the first nail in its coffin. The second was the fact it really didn’t bring much to the TV-watching experience. The third? It was too expensive, even at a discount. And the fourth? It was uncomfortable, and according to some surveys, straining many people’s eyes and giving them headaches. This week we learned that both LG and Sony have now stopped making 3D-enabled televisions. The firms follow Samsung - the world’s biggest TV maker - who confirmed the move last year. It means there are currently no major manufacturers making 3DTVs. At this year’s CES trade show, there was barely a whimper of 3D TV, compared to just two years ago when it was being heralded as the next big thing. But you could argue that 3DTV was never about the home experience. Where it would come into its own was in huge cinemas with full surround and the kind of environment that would do the new(ish) medium justice. But here, too, things have ground to a miserable halt. Despite the moderately promising start made by Avatar, no single 3D production ever became a must-see. The 3D high point for me was the remake of the Jungle Book, but the enjoyment there was clearly the return to the songs that soundtracked my early childhood - not the fact the odd branch stuck out of the screen, even if it did enhance the immersion of the jungle which had been so beautifully animated. 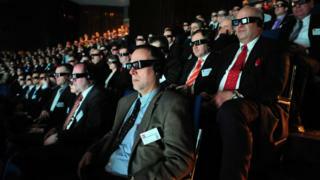 Image caption "One is moderately entertained..."
In the cinema, 3D was milked for all it was worth. Watching the 3D version of the film would often be a more expensive ticket. And while some theatres would give you free glasses you could return at the end, many would make you pay for them on the basis that you could “bring them back next time”. Imagine being the sort of person who brings their own pair of 3D glasses to a date. It's up there with owning your own pair of bowling shoes. Then, having to watch an hour’s worth of hollow Hollywood tat with plastic strapped to your face would soon see off any chance of an eventful evening. Even James Cameron, who directed Avatar, is fed up with 3D. It has "become a studio-driven top down process to make money”, he said (as if Hollywood has ever been anything else). The cinema-going public was immediately sceptical - knowing that the more the movie industry told them it was the next big thing, the more it felt like a pathetic gimmick. To quote The Oatmeal, “saying that 3D movies are the future of cinema is like saying that Magic Eye books were the future of literature”. Which is why most major studios have just about stopped bothering. The former head of Dreamworks Animation said that the industry “blew it” with 3D, something he blamed it as much on poor story-telling as limitations of the tech. And while there are plenty of 3D films lined up for this coming year, many of them have been bodged together using post-production, rather than filmed with 3D viewing in mind. There is still an audience for the technology in China, but it’s with no great sadness we accept that 3D is rather quickly on its way to being technology of a bygone era. A format that lost a format war without even having an opponent. It may well resurge. There has been good progress in making glasses-less 3D which, to my mind, is the biggest barrier here. But such innovations would just have to an added feature rather than the be-all-and-end-all - the window for selling 3D to the public has been slammed shut. According to CNet's report, TV makers are instead focusing on newer technologies such as HDR. And at CES 2017, one crowd-pleaser was LG's super-thin and light TV - the kind of innovation, I thought, that appealed to more people than something like 3D. Movie studios are pouring resources into virtual reality story-telling. I took part in a demo a year or so ago by the Oculus VR team at Facebook - it was a short animated film about a lovely little hedgehog who invites you into his home and… you’re six years old again. I cheered. I awww-ed. It’s remarkable - and it won an Emmy. Virtual reality is heralding new levels of realism and immersion to gaming, and films could, and hopefully will, follow suit. Which is great - because wearing a virtual reality headset doesn’t make you look silly at all.